I saw a link to one of this guy's videos on Facebook. What can I say... I fear I might seem a little contradictory here, especially with spending so much time recently battling the windmills at Philips, but I have to admit I don't care how this guy feels about stay-at-home-dads. I put a couple of videos here, just for reference, but the short version is that there's a sweaty clown on a stage who comes up with biblical references that prove men who stay home to raise kids are not men and that women naturally belong in the home. Now why don't I care? What he says is not shared by anyone I know. What he says is not shared by the mainstream in society. What he says is not even shared by most Christians. Sure, he has thousands of followers, but it's a big country, and big-mouthed clowns find an audience. When he forms a militia of equally clownish Tintin-haired characters, I'll feel the need to fight back. Until then, Pastor Mark Driscoll can enjoy his hair, his submissive pathetic wife, his army of brainless followers, and the money he makes out of his hateful lectures. A father in my 4-year-old boy's class drops his girl in school and a kid comes up to him. "Where’s your guitar?" he asks. "I didn’t bring it today. I’ll bring it tomorrow." "Are you going to play Cat Stevens again?" "Well, maybe tomorrow I’ll play Beatles songs"
And then it dawned on me. There are many unknowns in life. In fact, there are very few concrete facts in this changing world. But one thing is clear. See, I've done things in life. I played in a band. In London. In front of thousands of people! (Well, hundreds.) I jumped off a bridge! I had a near-death experience once. I sleep-walked in a land-mine! But it's no use. I have to admit--to my disappointment and to that of my boy--I will never be the coolest dad in school. 2. Philips Norelco 2: Now With More Offensive Marketing!!! Thanks to everyone who shared these posts on Facebook and on Twitter, and especially to Zach from 8bitdad for emailing Philips and tweeting its PR account. I don't know who or what eventually made Philips change their website (they didn't let me know about the changes), but I'm glad it happened. Today, Philips deserves my gratitude*. * It's a small victory for fathers and for parents in general, but I have to mention that once I saw the changes on the Philips Norelco site, I quickly checked the Philips Avent site. Unfortunately, everything is still the same there. 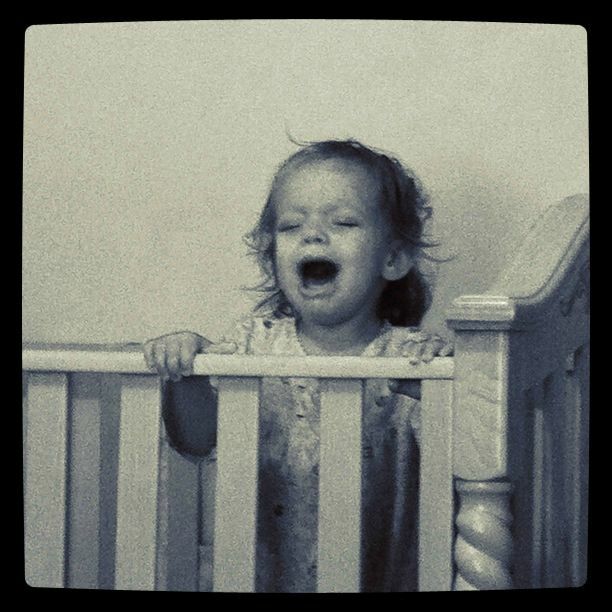 The baby-bottles are under the "Mother and child care" section, and the section titled, "Tips for bonding with your baby" still ignores fathers (and as mentioned in the previous post, tells mothers to invite their friends to look after the babies while the moms have a Me Time tending the garden). Well, change takes time, but any positive change, no matter how big or how small, and no matter how many footnotes it contains, is a move forward. My favorite photo from my childhood is one where my older sister and I are crying in the back seat of our dad's car. Actually, we're not even crying by then--we're at the stage of post-tears sadness, probably can't remember what we were sad about, but still filled with sadness that feels like it would never end. I can't tell for sure what makes it my favorite photo. 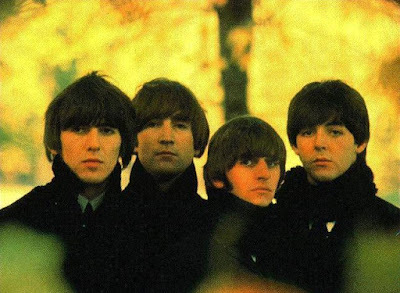 Maybe it's because unlike all the staged photos we had, when this one was taken we weren't told to smile for the camera. It was genuine, and it probably shows our true childhood more than any other photo. Not that we were sad kids. It's not as simple as that. 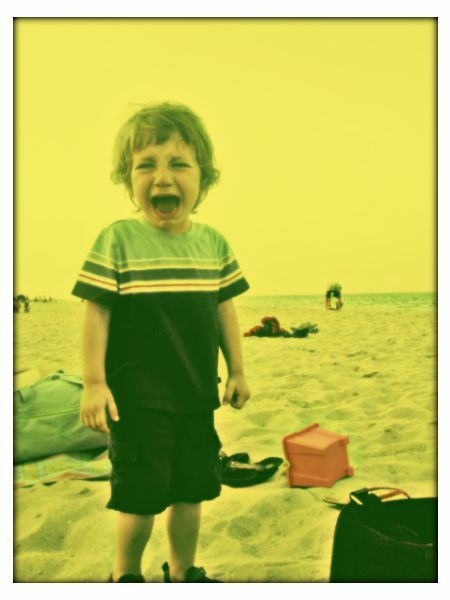 We had great joy and great sadness, like all other kids (well, like adults as well, only as adults we learn to be comfortably numb when it comes to extreme emotions, I suppose). But in that one picture, we weren't asked to be fake and to smile no matter what. Instead, we were emotional and for once, real. Thing is, now that I'm a dad, I often make the same mistake. I take dozens of photos every day, but in the end, they're all the same, aren't they? My kids being happy and cute, enjoying every single minute of this gift of life. 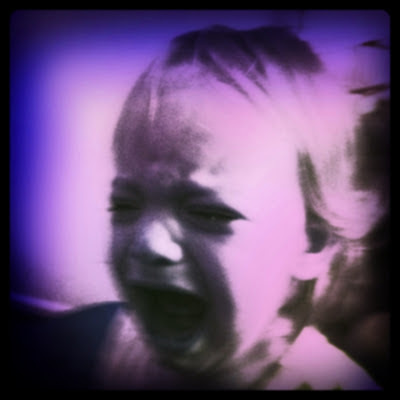 What kind of heartless parent sees his kids crying and thinks, "Kodak Moment!" after all? Still, I try to do two things to keep the memories more genuine. In the end, we will all remember this time only from photos and videos, so it's my responsibility to show things as they were. First, I never ask my kids to smile for the camera, and I get uncomfortable when others do. You want my kids to smile? Do something funny. They like to see people fall over. Want my kids to smile? Hit the floor. And the second thing I do is take the occasional candid photo of my kids when they're sad. It's not easy, because they might notice what I'm doing and resent me for that, but I feel I must do it. For their own good... See, one day when they're depressed (they'll be teenagers or even adults), they'll find themselves looking at old photos and they'll realize life has always been and always will be about highs and lows, and that just like they've dealt with the lows as kids by moving on, they'll be able to do the same for the rest of their lives. Sadness is temporary. I hope by capturing the sadness, I'll show them happiness wasn't just a childhood fad. There are two types of blogs I try to feature here. One is blogs I feel I'm introducing. They have great writing but not enough people know them. I hope I can get a couple of new visitors or subscribers to their blogs and get some more voices of fathers into the conversation. 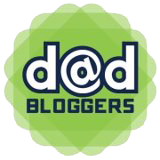 Then there's blogs like DadWagon, which have been around for a while and which I commented on many times. These fall into the distinguished "I haven't written about this blog yet???" category. The blog, written by two New York dads (although the About page mentions a third who must have been absent for a while), is always original and thought-through. Even the header. The latest post talks about the cost of preschools in New York and about the inherent irony of charging an obscene amount that--even if parents can somehow afford--means great sacrifice. And that without even getting into the foreskin-reattachment surgeries parents need to schedule for their boys just so they could get into the more affordable Catholic preschools. There's humor, heart and soul in all posts, most of which touch the personal lives of the writers and their families to give a bigger picture of modern fatherhood. If you've somehow missed this blog, it's not too late to start reading now. Philips Norelco 2: Now With More Offensive Marketing!!! 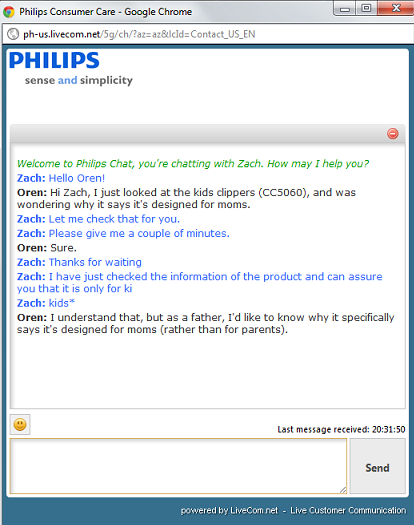 A week ago, after a month-long wait for a Philips rep to call or email me (as promised by another Philip representative), I went ahead and published my post about the ignorant way Philips markets their kids' hair clipper as "Made for Moms." That post showed Philips' previous cooperation with blogging dads for the cynical marketing ploy that it was--an attempt to gain publicity in a niche market, rather than a sincere attempt to as much as acknowledge fatherhood. During this past week, I've also found a link to some of the top people at Philips, and sent them an email, reminding them of their promise to call me back, and linking to my post. Zach from 8BitDad sent an email to other Philips marketing execs, also linking to the post. 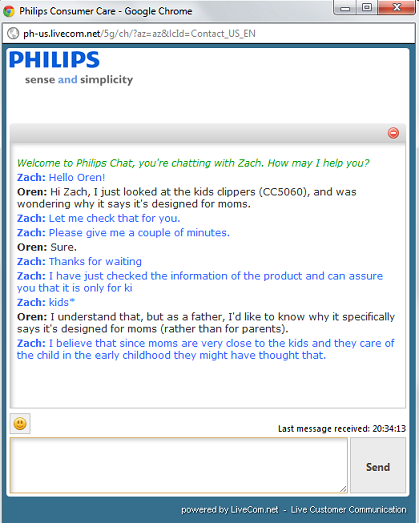 In his email, Zach mentioned other mother-only marketing by Philips, specifically for its Avent brand. Now, some of the Avent items are breast-feeding accessories, and it would be silly to market them to parents in general. However, (at least) most fathers feed their babies with bottles now and then, so to market baby bottles as motherhood products ignores reality and intentionally excludes fathers. And what about their inspirational baby-monitor tips page? "As a mother you know there is nothing more important than the connection with your baby, this is something we really take to heart at Philips AVENT." Good on you, Philips. I have to assume that when Mommy connects with our baby I will get drunk in my man-cave. If it's good enough for Philips marketing execs, it's sure good enough for me. "You know that making the most of being a new mum requires a little bit of rest, make sure you set aside some time for yourself even if it just means getting a friend over to watch your baby while you do a little gardening. It's an important part of social development for your baby to enjoy time with new people." I was also curious to revisit the kids' clippers page on Amazon. I was first made aware of this product by reading an Amazon review written by a mother, complaining about the way Philips ignored her husband in its marketing, so naturally I headed there. Scrolling down, I stopped at the product description. 1. Amazon itself has an equally idiotic marketing plan for parents. You can sign up for their parenting plan and get discounts on some items and fast shipping for a year. However, you will then be a part of "Amazon Mom." Now, dads, grandparents, aunts, foster parents, and all other--let's face it--secondary caregivers (you know, the ones who deal with kids when Mum is out gardening) are welcome to join. Mighty nice of Amazon to make us feel included in the b-list of parenting. 2. And the second point is that if Mum is out gardening as soon as she can take a break from her parental duties, her hands might become rough, and then what? Her man-hands won't be able to handle this delicate machine, obviously made for more princessy moms. That third one is a Dutch marketing firm based in Holland, which did (and probably still does) some of the marketing for Philips (a Dutch company). So the emails worked and finally Philips paid attention. I received this email on Sunday. Thanks for your candor in reaching out and sharing your thoughts with us. I apologize that you did not receive a response sooner. With regards to your comments about the Philips Kids Hair Clipper, we fully appreciate that both moms and dads take an active role in parenting and our campaign was not meant to convey otherwise. Our research shows that moms are the primary shoppers and users of hair clippers for kids, so we designed a marketing campaign specifically for that audience. Some of the language that you reference speaks directly to insights that were shared by moms during our product research and development process, such as the smaller, more ergonomic design that makes the clipper easier to maneuver. Consumer insights are a huge driver in Philips’ product and marketing innovation. 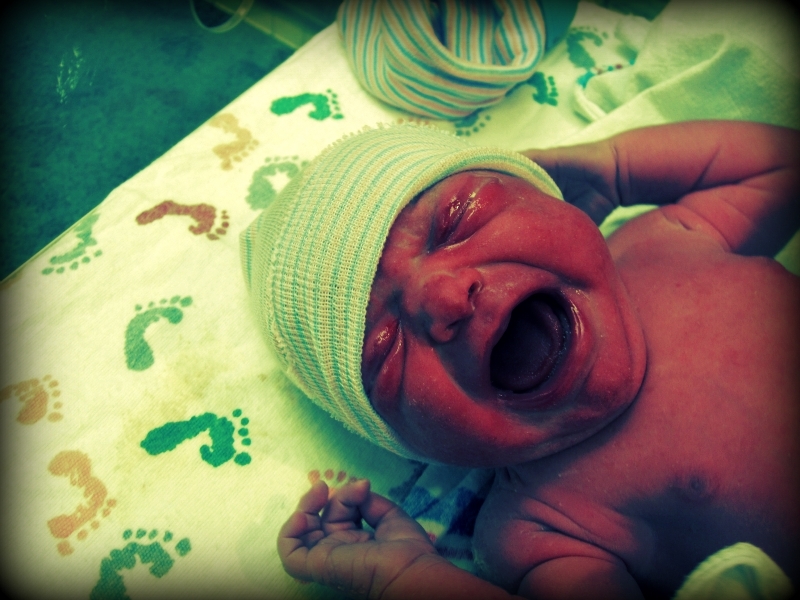 As such, we develop campaigns that resonate with a core consumer group – in this case, moms. Again, it’s not meant to be exclusionary, but rather direct and relatable for the person who is most likely researching and seeking information about the product line. Thanks again for your feedback and I hope this provides some insight. So everything is clear now. The kids' hair clipper is small and made for princessy hands not because Philips hates fathers, but because that's what their focus group wanted. Their focus group of moms. Furthermore, Philips doesn't mean to be exclusionary when their parenting products specifically market only to single mothers with small hands. After all, if you're a mother whose hands are not that delicate, or if you're a dad, you're probably covered anyway by an extension on your Swiss Knife. It can all end here, with yet another tone-deaf company with idiotic and cynical marketing, stuck with ancient ideas about parental responsibilities and hand-sizes. Or we can try to push forward to make a change. 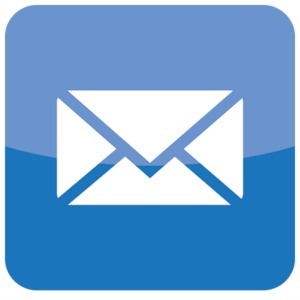 You can join me in emailing the Philips execs listed on their marketing page, or email Ms. Jenest, whose email address was included in the email she sent me, and express your concerns. I'm terrible at self-marketing, so it's uncomfortable for me to say that, but as long as I believe it's for a good cause--you can link to this page and/or to last-week's post on Facebook and on Twitter. Even better, you can write about it yourselves if you have blogs. The last thing I will try to do, and hopefully get some support from readers (because I have no idea what I'm doing), is try to get some media attention. It's one thing to write a blog post about the exclusion of dads in marketing, and it's another thing for the national media to pay attention. It's not just me and it's not just Philips. Maybe we can create interest in the way blogging dads in general try to push companies to accept the shocking fact that fathers love their children too. 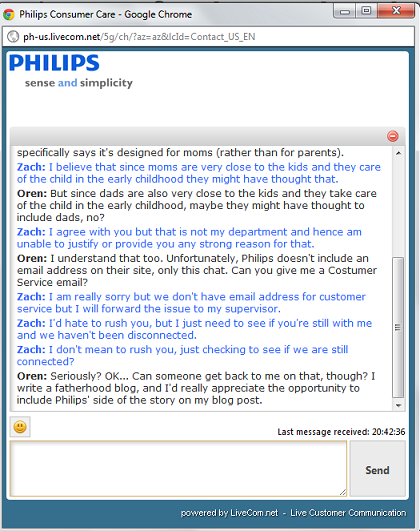 1/24/12 Update: Philips changes its website: Thanks*, Philips! It's a Philips Norelco hair clipper for kids. Since it might be difficult for kids to use it by themselves, they need their parents to do it for them. By parents, Philips mean mothers. Last month, Philips Norelco matched up donations to a Movember group of blogging dads, including How to be a Dad. Philips is not the first company that donates to charity in exchange for a product review, and they must be commanded for this cynical but ultimately worthy type of marketing. By connecting to blogging dads, Philips made a pro-fatherhood statement. Unfortunately, at the same time, the company says the exact opposite with their website marketing. The message that comes out is that sure, men are good for shaving and grooming, but only mothers do parenting. 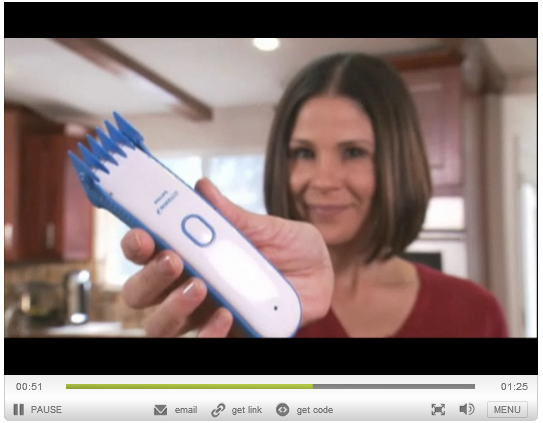 In addition to the "Made for Moms" in the product description, Philips includes numerous videos teaching parents mothers to use the clippers. All videos show different style of mothers (referred to as "Supermoms") cutting kids' hair in different styles. You want to see men? 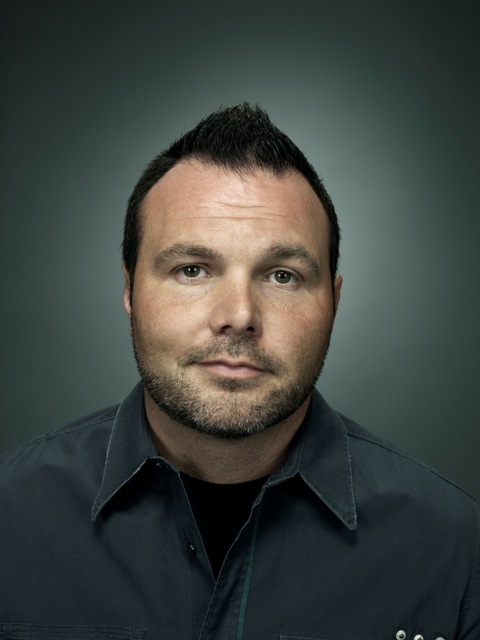 Go back to the shaving/grooming section of the site. Parenting is no place for men. "I believe that since moms are very close to the kids and they care of the child in the early childhood they might have thought that." You can see in the following screen shots that I tried... 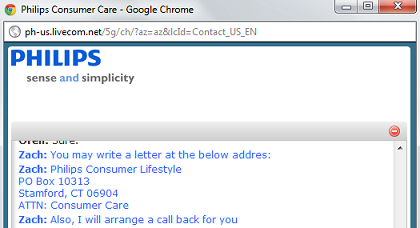 I was even promised a phone call from Philips. Unfortunately, as I said, it's been a month and no one has bothered. According to Philips, then, dads are good for marketing purposes, especially when the dads involve themselves with a shaving-related charity like Movember. However, dads are not good for anything to do with being actual dads. Parenting is left for professionals like Supermom. In the meantime, dads, keep shaving those armpits. 1/10/12 Update: There's a follow up: Philips Norelco 2: Now With More Offensive Marketing!!! 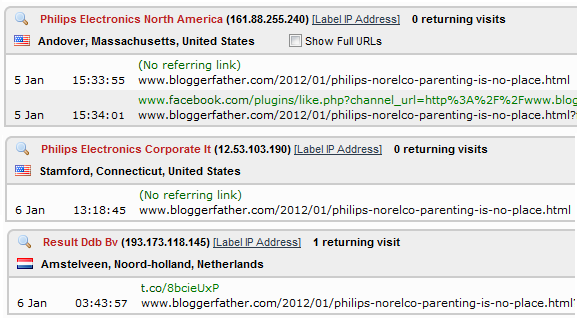 1/24/12 Second Update: Philips changes its website: Thanks*, Philips!